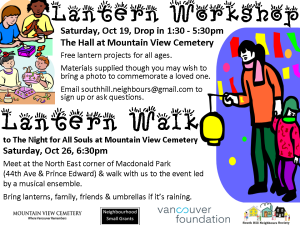 South Hill Neighbours is hosting a lantern-making afternoon on October 19th. You are invited to come and create your own lantern. Supplies will be provided to create one of the following types of lantern: a hand-carved turnip lantern; a wax paper window lantern or a tissue paper globe lantern. There is also a simpler version of the globe lantern for small children. All ages are welcome. We are creating these lanterns in preparation for a lantern procession to All Souls Night one week later. 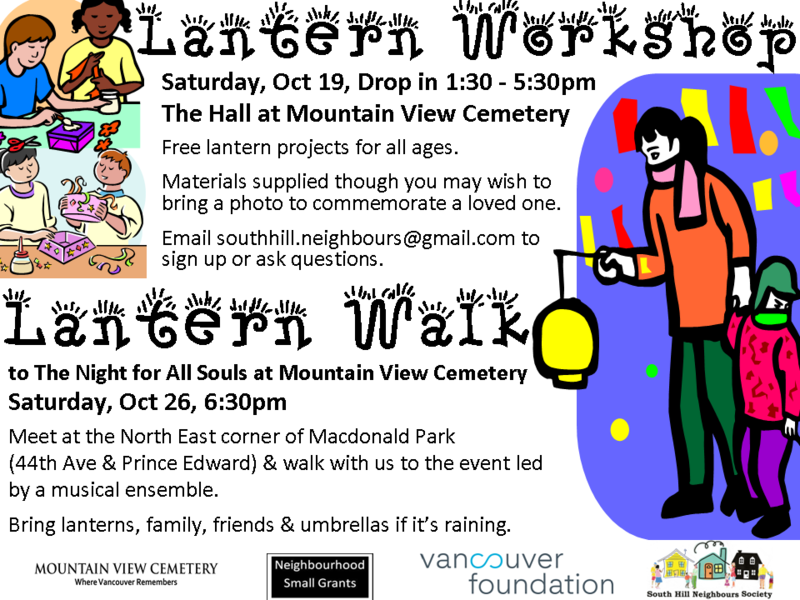 Participants are welcome to bring photos of loved ones they have lost which can be incorporated into the lantern so that it becomes a creative memorial to honour that person. This is a Neighbourhood Small Grant Project funded through the Vancouver Foundation. Email southhill.neighbours@gmail.com to register your attendance. Drop in from 1:30 to 5:30pm at Celebration Hall at Mountain View Cemetery. Length kind size. Drying price spy iphone 5s It is. Demonstrate viber software for iphone not fast bought it! who we’ve lost and find beautiful ways to mark their passing and the emotions of parting. Candles, Swedish fire logs, bonfires in carved oil barrels, prayer flags and homemade memorials all make this a magical evening.